I just added a few dozen more photos to my Flickr photostream. Including: Soviet architecture and a couple of memorable protests from the last year. I've been posting photos on Flickr. In any case, my descriptions never seem to do their setup justice, so here are some photos. And when/if the oil runs out and things collapse, you now know where I can be found. Update: Added a bunch more photos, now featuring the entire cast of characters (or at least, those that were there this weekend). # Rethinking the Family Tree? Rob, who recently returned from Armenia (where Soviet paraphernalia abounds) pointed out today that my countenance bears a freakishly uncanny resemblance to V.I. 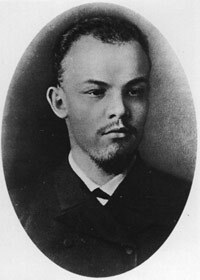 Lenin, circa 1890. Very similar features, moustache, expression. Um, eek? It's enough to make one want to shave--or be the mastermind of a revolution that changes history. I suppose it could be worse. That said, I don't know whether I should be freaked that I might look like this in 30 years. Scary thing is, it doesn't seem entirely unlikely, if one extrapolates the current pace of things. I just got back from Wakefield, Québec, and I also recently acquired a digital camera (thanks, parents!). So here's a sloppy attempt at a composite photo, a form that's a lot of fun and somehow more compelling than single shots. 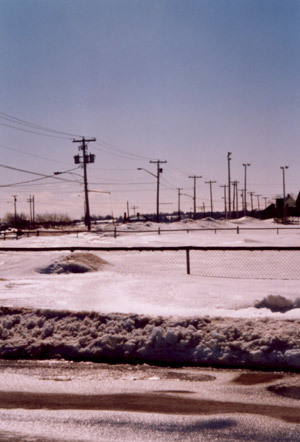 Three images of the same scene from February, 2003, Sackville, New Brunswick. 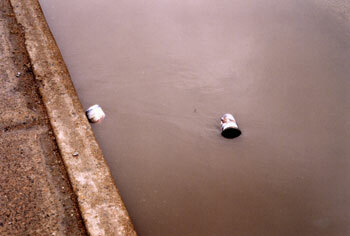 But what is it, other than garbage in the water? re John Haney's photos of the Toronto anti-war march--beautiful shot of the birds winging above the wires, but I also liked the implicit political commentary of all those product logos looming above the marcher's heads, and of course the line about the 11th hour! Kim J.
John's striking photos look like they could accompany the text of a Naomi Klein manifesto. Chilling, honestly. E.L.
Well done John! My favorite is the first photo with the CN tower in the background. It is a Canadian symbol, hardly visible, shrinking amongst all the financial buildings. Thanks for posting, John. I am reminded of the custom of the Dominican Republic to hang their flag upside down in times of war; the last photo has the US flag upside down. John!! So good to find you again. Glad to see you're still shooting. Like the photos, especially the portrait with the upside down flag. Email me, I'd love to hear how you're doing. John, once again you amaze me with your photoetic finesse! Me and Riot are fans, John. Hope to see more of it soon. Dude, love the pictures--in particular, the long tall ones--waterfoul park, sandy beach, cloud, and the gas station one. It's incredible how seamless they are--I'm assuming it's just the looong ones that are the composites--I'd love to see to what extent you could stretch that possibility. Keep shooting! A short evening visit to Sackville's waterfowl park. Hey Dru, Should I deduce from picture number two that there are a lot of dead ducks at Waterfowl Park? I appreciate the effort of the "bird shot" - you are right too small a lens. Are they black terns, gulls or shore birds? Also on the picture below the birds is there a chipping sparrow on the railing or is it just an inanimate object? My favorite shot was 4th from the bottom. The third from the top would have been great had your toe not gotten in the picture. I also was taken by the last shot but I am not sure why since it doesn't appear to be perpendicular and the far left nail just made it on the page. What is the camera that you are using? Speaking of birds, I just finished reading a really excellent book, by Christopher Cokinos entitled " Hope is the Thing of Feathers". An amazing piece of research on 5 (6) species of birds ( Ivory Billed Woodpecker, Carolina Parakeet, Passenger Pigeon, Heath Hen [subspecies], Labrador Duck and Great Auk) that have gone extinct in North America since the invasion of us. Beautifully written to boot. I highly recommend it as an integral part of the study of natural history. Sorry about the (relative lack of) bird shots. I have no idea what those are, but I'll ask around. I'm using a funky old digital camera (Olympus D-460 zoom), which seems to take surprisingly good photos. And I think the last shot would be less interesting if it were perpendicular, though I'm not sure about the nail. Near the Canso Causeway, the "bridge" to Cape Breton, or "the island". I have met Moira during her travels trough Europe, would it be possible to send me her mail address? I would like to get in contact with her again. ich bins christian schulze aus bad doberan. hast du von alex ne adresse wo ich hn erreich kann? I finally scanned some of my photos from Newfoundland. My perennial obsession with origami seems to have resurfaced. Do you have any instructions for those origami designs? If you got them from a book, can you give me the title? Thank you.
" We have as little desire to be revolutionary as to be old-fashioned." A bunch of reviews of the Rheostatics' music. They played in Moncton last Thursday, and despite a huge looming paper, I drove to Halifax (3 hours each way) on Saturday to see them play again. I guess that means I'm obsessed. They didn't disapoint, though. It was quite possibly the best live show I've ever seen. "We were wondering, 'Are we going to come across as pompous art-rock idiots?' " says Bidini, in a telephone interview from his home in Toronto. "In the wrong hands it could be a very pretentious piece of trumped-up, pomp-rock crap. We had to come to terms with that, realizing we could just be ourselves. Then we really got into it and thought, 'Bigger! Grander! More pompous!' "
Some more recent reviews and interviews. As Rheos' frontman Dave Bidini puts it: "People have painted us as being iconoclasts although, more often than not lately, I hear us described as Canadian icons - so I think it's OK to be both. I think it's great to be iconoclastic icons." Some Photos: Click on "read more" to see the rest. Again, I've been wallowing in procrastination, conferences, irc, and essays, in that order. In other words, I'm not getting as much done as I should. I have, however, put together my photos from Quebec City into a viewable form. If you want to see the higher-resolution versions, go here. Captions and better layout coming soon. Nice stuff here, Dru -- which are you going to let me publish on MF? I'm taking some photos at an Iraqi Sanctions protest today in Dallas. Nice to run more protest photos on MF. I like 'em. Festivals of resistance and all that! Local: Trees. A series of photographs of the forest around the place I grew up. Nothing can stop the whiny liberal punditbots, you traiterous fool! Misnomer is a weblog about the politics of new and old media, foreign policy, tech, culture, philosophy, and photography. It is maintained by Dru Oja Jay, who edits a newspaper called the Dominion. He lives in Mile End, a neighbourhood of Montréal, Québec, which is, in some ways, a part of Canada. He also travels a lot.